Mirah Belle's natural skin softening soap recipes have been developed to produce a mild, skin-nourishing effect that not only heals the skin but also leaves it feeling clean, smooth and fragrant. Mirah Belle brings to you cold processed skin softening soaps that retains natural glycerin. Individual skin care needs are unique, so we offer a variety of formulations for all age groups and skin conditions. Pure Essential oils are added to each variety depending on the skin type and condition. 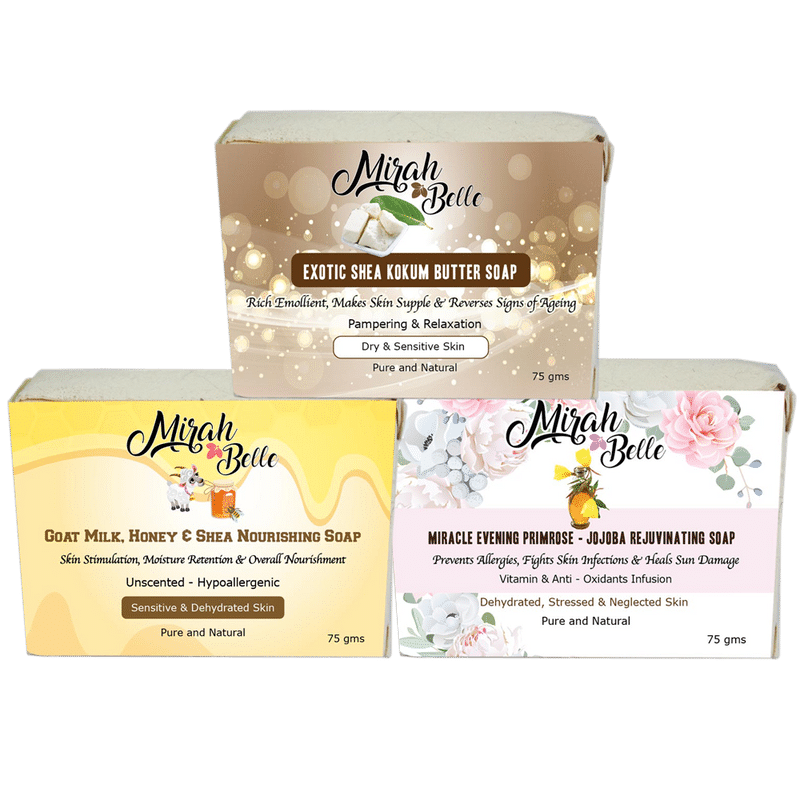 A perfect blend of natural oils, Goat Milk and Shea Butter nourishing Soap is a handmade soap that is free from synthetic dyes and fragrances. The color is natural from the oils that have been added. Goat Milk and Shea Butter soap will leave your skin soft and close to its natural pH level. This soap is loaded with essential nutrients like Vitamin C, B1, B6, B12, and E. Our soaps are free of Chemicals, Paraben, Sulphate, SLS, and Silicon. We believe in using only natural oils and herbs. Handmade and Hand cut with love. Rejuvenate Yourself with an All Natural Organic Soap After a long day at work, pamper yourself with the goodness of nature. Our bodies are constantly exposed to dirt, sun, and pollution that ruin our skin. Why torture your skin with harsh chemicals that will only provide temporary results? Use the Miracle Evening Primrose-Jojoba Rejuvenating Soap to unwind with certified organic ingredients that nourishes and cleanses to bring a natural glow from within.